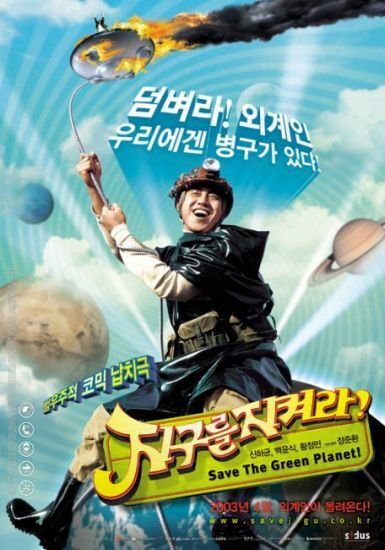 Cult classic Save the Green Planet (지구를 지켜라!) is perhaps best described as Peppermint Candy (박하사탕) meets Sympathy for Mr. Vengeance (복수는 나의 것) through an amalgamation of dark comedy and disparate genres. While this might sound like an absurd concoction, writer/director Jang Jun-hwan (장준환) merges the assorted features into an incredibly compelling and entertaining whole, one that moves seamlessly from the madcap to the profound in the creation of a unique celluloid gem. Unfortunately the cult status Save the Green Planet has acquired in foreign territories wasn’t replicated on Korean soil, where it took a nose-dive at the box office. This is a genuine shame as, while not perfect, Save the Green Planet highlights director Jang’s distinctive style and is a highly refreshing departure from other, more formulaic, productions. Recluse Lee Byeong-gu (Shin Ha-kyun (신하균) becomes obsessed with the notion that Earth is under threat from aliens hailing from Andromeda. To save the green planet, Byeong-gu and his partner Su-ni (Hwang Jeong-min (황정민) kidnap the CEO of a large chemical conglomerate, Kang Man-shik (Baek Yoon-sik (백윤식), believed to be one of the most senior ranking aliens. Torturing the executive for answers, Byeong-gu attempts to discover the clandestine machinations of the race, as well as saving his mother who he also believes to be a victim of alien experimentation. Yet the kidnapping does not go unnoticed by the law, with the police force – as well as a renegade cop – following the trail. Is Byeong-gu mentally unstable, or does he hold the key to Earth’s survival? ‘Madcap’ is a word often used to describe Save the Green Planet and that it is, although not in the haphazard manner the word implies. Director Jang Joon-hwan displays a keen understanding of the array of cinematic traits he employs, competently structuring them in order to provide the best possible use of generic conventions whilst also deriving dark-comedy from the source. Scenes featuring horror, thriller, and dramatic traits flow seamlessly, constructing dramatic tension yet often exhibiting a tongue-in-cheek sensibility as it does so. Torture sequences, for example, feature toe-curling moments but are also incredibly – and darkly – funny, as evil CEO Man-shik has antihistamine rubbed into wounds and is routinely degraded. Similarly, references to accomplished cinematic classics that arise throughout the film are genuine laugh-out-loud moments, and are enjoyable for cinephiles and occasional movie fans alike. However, humour is just one of the many facets that make Save the Green Planet so entertaining. What truly makes the film so engaging are the underlying themes of the narrative and the psychological disposition of central protagonist Byeong-gu. 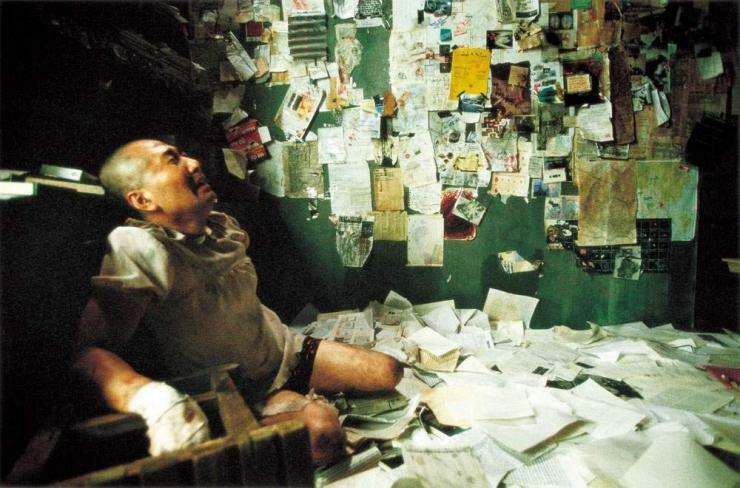 From the outset, Byeong-gu is conveyed as seriously mentally ill. His theories regarding aliens from Andromeda is the stuff of B-movie science fiction material, while his attire and quirkiness belie the horrors that await in his private torture chamber. Yet his unique perspective on the world is an ironic one, as he uncovers scandals, corruption and amorality in attempting to prove the existence of aliens. Byeong-gu is indeed correct about the Earth being under threat, just not in the manner that his neurosis has constructed. It is in danger through the machinations of the rich and powerful, features which Byeong-gu strips away in order to reveal the ‘truth’ – and potentially atonement – making the unhinged young man something of an anti-hero. As a result of all his eccentricities the film is a deeply psychological exploration of Byeong-gu’s paranoid mind, one that becomes more and more apparent through multiple viewings. As the unstable protagonist’s history is uncovered, director Jang crafts a biting social commentary regarding contemporary Korea, one that certainly would not be out of place in a Lee Chang-dong film. In doing so Byeong-gu’s cause – and indeed the film itself – is given incredible heartfelt merit, so much so that despite the atrocities he commits his status as an anti-hero is actually heightened. Director Jang intelligently articulates Byeong-gu’s psychosis through the mise-en-scene of the homestead, a multi-tiered countryside abode that features dimly-lit mannequins in the basement and bee hives in the garden, all symbolically linked to is unbalanced mind. With such a wealth of character material, Shin Ha-kyun doesn’t disappoint. Arguably his career best, Shin is simply excellent in the role with his chameleonic ability to switch between manic highs and solemn lows incredibly impressive and, despite the often comical attributes, sincere. 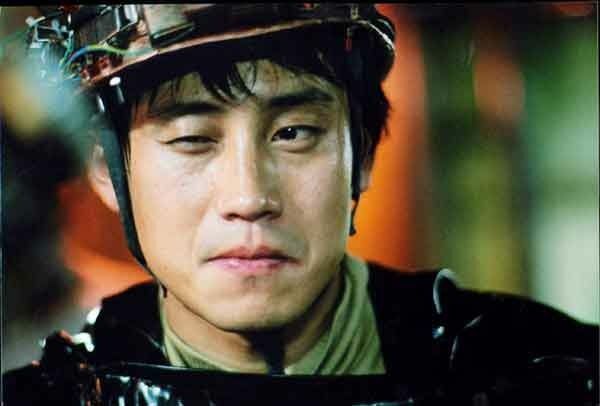 The protagonist could easily be another silly psycho but Shin gives Byeong-gu heart and conviction to make him truly sympathetic, and one of the most memorable characters in contemporary Korean cinema. Such focus unfortunately isn’t bestowed upon other members within the film, notably love interest Su-ni and the assortment of bumbling and renegade cops on the kidnapping trail, ultimately leading to plot threads that are never really mined for their potential. But as Byeong-gu is so charismatic and engaging such shortcomings are easily ignored, as it’s largely due to him that Save the Green Planet is such a compelling genre-bending film. Save the Green Planet is a thoroughly engaging and fun amalgamation of disparate generic features, all interwoven into a uniquely thrilling whole. Yet in addition to the madcap antics, director Jang Joon-hwan has crafted a biting social satire as well as a highly memorable, psychologically unbalanced anti-hero in the form of Byeong-gu. While the array of characters means that not all get a chance to shine, Byeong-gu’s heartfelt conviction overshadow such shortcomings. Save the Green Planet an incredibly enjoyable, strikingly powerful, and uniquely refreshing film.